While I was in working in the Sierra, México passed the Biosecurity Law for Genetically Modified Organisms (2005), essentially paving the way for the legal development of genetically engineered (GE) crops in México. This law is commonly referred to as the "Monsanto Law" in México, and its passage was opposed by many indigenous farmers and campesinos. 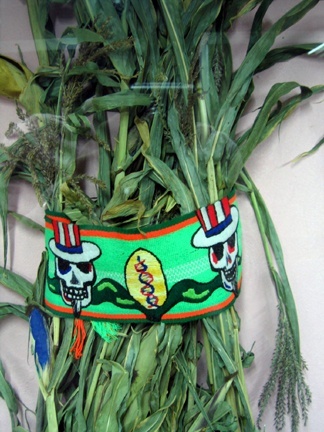 It is thought that GE crops first contaminated corn crops in Oaxaca state in, vis a vis imported, unlabeled, and heavily subsidized U.S. corn intended for animal consumption. This design reflects my often conflicted feelings in regards to my country, especially as I travelled through México, as well as a bit of homage to Gary Gutierrez, animation director of the Grateful Dead Movie.